The natural response of a Christian to this story is to either doubt its authenticity or to shrug it off with a pitying “Shame on him, but that’s not the case in my church”. Of course the phrase ‘my church’ gives the lie to the claim, doesn’t it? I attend a local church, in fact I am the Lead Elder/Senior Pastor of that church, but it is not MY church. The Lord Jesus Christ is the head of the church, and that includes its every local expression. I understand this, but how do I apply this reality to the way the church functions? Our normal Sunday service has three main components: Social interactions like sharing and notices; worship interactions like singing, praying, ministry in the Sprit, the offering, and so on; and Word-based interactions like preaching and prophecy. The actual order of service mixes these components and presents them in various combinations each Sunday. Where is Jesus in all this? Well, if He is not the focus of the preached word, in a fairly direct sense, then we can’t really say that He is ‘in’ the preached word. If the singing is not predominantly to Him, and not just about Him or His benefits, then in what sense is the worship Jesus-cantered? It is a good exercise to go through the titles of the songs we sing to see which are to Him, which are about Him, and which are essentially about ourselves. Even the notices and sharing can lack Christocentricity (Jesus-centeredness) if they are just about the churches activities, or what we have received or experienced. Of course the church is made up of people, so what about you and me; how central is the Lord Jesus to our lives? Is He the dominant, central person, focus, and presence in our lives when we are not ‘at church’? 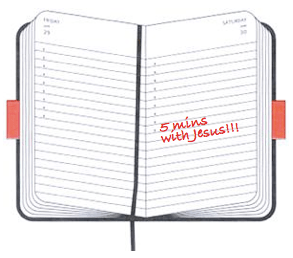 Or does He get a five minute slot in the busy schedule of our daily life? 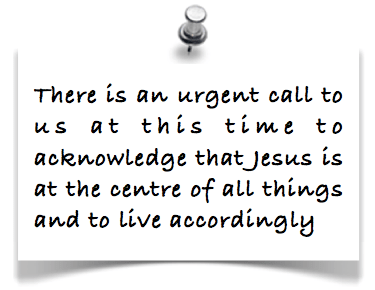 In the next several posts I will be developing the idea of the centrality of Jesus because I feel that there is an urgent call to us at this time to acknowledge that Jesus is at the centre of all things and to live accordingly. Dr. Len Sweet contends that the church is suffering from JDD, Jesus Deficit Disorder, but do we as individuals not also suffer from the same malady I wonder?